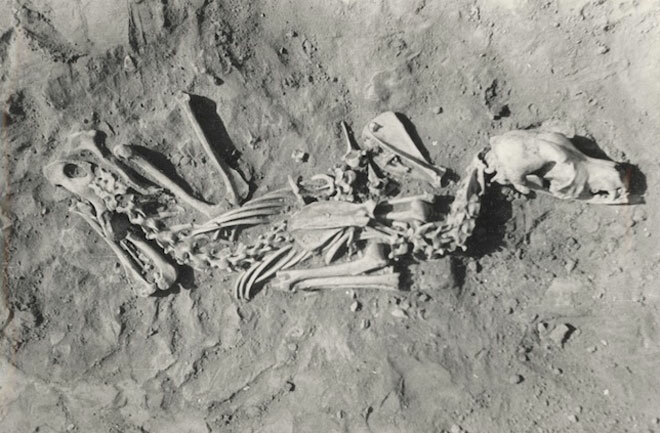 An analysis of ancient dog burials finds that the typical prehistoric dog owner ate a lot of seafood, had spiritual beliefs, and wore jewelry that sometimes wound up on the dog. The study, published in PLoS ONE, is one of the first to directly test if there was a clear relationship between the practice of dog burial and human behaviors. The answer is yes. "Dog burials appear to be more common in areas where diets were rich in aquatic foods because these same areas also appear to have had the densest human populations and the most cemeteries," lead author Robert Losey, a University of Alberta anthropologist, told Discovery News. The discovery negates speculation that dogs back in the day were just work animals brought along on hunting trips. "If the practice of burying dogs was solely related to their importance in procuring terrestrial game, we would expect to see them in the Early Holocene (around 9,000 years ago), when human subsistence practices were focused on these animals," Losey continued. "Further, we would expect to see them in later periods in areas where fish were never really major components of the diet and deer were the primary focus, but they are rare or absent in these regions." For the study, Losey and his team researched dog burials worldwide, but focused particularly on ones located in Eastern Siberia. Siberia appears to have been an ancient hotbed of dog lovers, with the earliest known domesticated dog found there and dating to 33,000 years ago. Dog burials in this region, however, span across a more recent 10,000-year period. The researchers found that most of the dog burials in this area occurred during the Early Neolithic 7,000-8,000 years ago. Dogs were only buried when human hunter-gatherers were also being buried. When pastoralists later came through, they did not bury dogs, although they did sacrifice them from time to time. "I think the hunter-gatherers here saw some of their dogs as being nearly the same as themselves, even at a spiritual level," Losey said. "At this time, dogs were the only animals living closely with humans, and they were likely known at an individual level, far more so than any other animal people encountered. People came to know them as unique, special individuals." The burials reflect that association. One dog, for example, was laid to rest "much like it is sleeping." A man was buried with two dogs, one carefully placed to the left of his body, and the other to the right. A dog was buried with a round pebble, possibly a toy or meaningful symbol, placed in its mouth. Still other dogs were buried with ornaments and implements, such as spoons and stone knives. One of the most interesting burials contains a dog wearing a necklace made out of four red deer tooth pendants. Such necklaces appear to have been a fashion and/or symbolic trend at the time, since people wore them too. "The dog buried wearing the necklace was buried in a region where human diets were relatively rich in riverine fish," Losey said. "The dog, however, was consuming relatively little fish, having a protein diet with more emphasis on terrestrial game. This suggests the dog was likely a recent arrival in the region, and its body chemistry had not yet adjusted to the local fish diet." All of the hunter-gatherer dogs were similar in appearance to large varieties of huskies, similar to today’s Siberian huskies. Erik Axelsson, a researcher at Uppsala University’s Science for Life Laboratory, has also studied prehistoric dogs. He too found that human and dog diets, burial practices and more often paralleled each other, revealing how close the dog-human bond has been for thousands of years. Axelsson said, "Dogs and humans share the same environment, we eat similar food and we get similar diseases." Based on the number of burials, we also often spend eternity together too.